Every year, my friend Lynne and her mum Jean, make a big batch of this mincemeat, and I’m lucky enough to receive a jar! This year I asked them to share the recipe, so I could pass it on to all of you. It is a moist mix with the perfect blend of flavours, and is a bazillion times tastier than any supermarket version. Thank you ladies, one year my jar may even make it to Christmas! 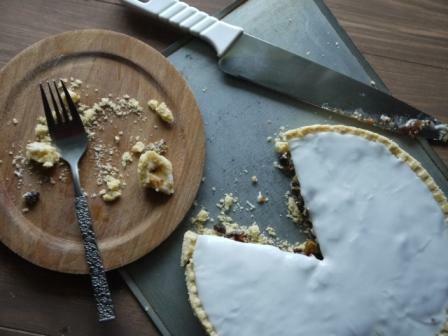 Normally, I bake the mincemeat in traditional little mince pies with pastry lids and all, but this year I was inspired when Jean mentioned her friend who makes one big pie, and drenches it in icing. OK, I’m sold! Blitz the raisins, sultanas, apple, peel & suet briefly until coarsely minced. Leave the currants whole. Mix all the ingredients together well, cover the bowl and let it rest stirring occasionally. 24 hours later pot into sterile but cold jars, leaving a little space at the top of each jar. Pop on a waxed disc and cover with the lid or jam pot cover. 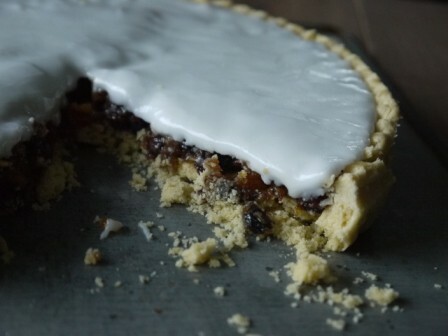 Have you tried mincemeat Bakewell, lighter than the usual Christmas pudding, and is nice cold as well. They have a thin cakey/spongey layer on top right? Looks yummy! I’ve never tried mincemeat before (always been scared of it to be honest!) but this looks really delicious! I’ve never made it either to be fair, but with lovely friends like Lynne, I guess I don’t need to! 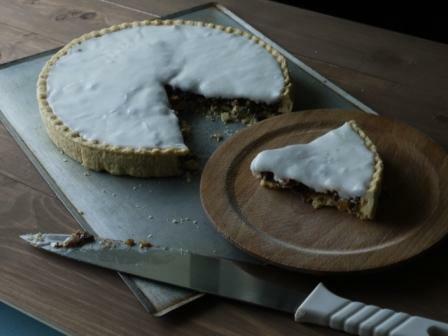 I loe the sound of the mincemeat tart covered in icing- that should go down well here with the sweet toothers! Oh yes! Hope they enjoy it!